It would seem the beautiful foxglove plant has more uses than just the garden. A novel drug screen in liver-like cells shows that cardiac glycosides, which are found in the leaves of the digitalis or foxglove plant, could reduce low-density lipoprotein (LDL) cholesterol differently than statins, potentially providing a new treatment for patients. 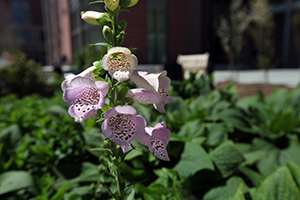 The foxglove plant in bloom on MUSC's campus. These findings were reported by the Medical University of South Carolina researcher Stephen A. Duncan, D.Phil., SmartState Chair of Regenerative Medicine at MUSC, and colleagues in the April 6 issue of Cell Stem Cell. Not everyone with high LDL cholesterol responds to statins. Statins increase levels of a cell surface receptor that removes LDL cholesterol from the bloodstream. However, statins do not work in patients with familial hypercholesterolemia (FH), who have a rare mutation in that receptor. It is an inherited disorder that leads to aggressive and premature cardiovascular disease. FH patients have very high cholesterol and can die of cardiovascular disease by their forties. The existing drugs for FH can cause fatty liver disease, and the best treatment is a liver transplant. Duncan and his graduate student Max Cayo, who is finishing his M.D. at the Medical College of Wisconsin, developed a drug screen to identify an alternative to statins. Apolipoprotein B (apoB) is a molecule that liver cells use to make LDL. Drugs that decreased apoB could potentially lower cholesterol independently of the LDL receptor in FH patients and also in patients with other forms of high cholesterol. FH was a perfect model for testing alternatives to statins. Yet the rarity of FH meant these liver cells were scarce. Duncan’s group made induced pluripotent stem cells out of skin fibroblasts taken from a single patient with FH. Stem cells continually double their numbers while in culture. This meant that a sample of converted skin cells from a single patient with FH provided a renewable source of liver-like cells that retained the mutation. The group tested these liver-like cells with the SPECTRUM library, a collection of 2,300 pharmaceuticals, many of which have reached clinical trials. Surprisingly, all nine cardiac glycosides in the collection, some widely prescribed for heart failure, reduced apoB in liver-like cells from the patient with FH. In further tests, they also lowered apoB in human hepatocytes and in mice engineered to grow normal human livers without the FH mutation. Next, the team combed through more than five thousand medical records of patients prescribed cardiac glycosides for heart failure who also had LDL cholesterol records. Similar drops in LDL levels were observed in these patients as in a matching group of patients prescribed statins. This study provides the first evidence that cardiac glycosides could potentially reduce LDL cholesterol independently of the LDL receptor, where statins act, by reducing apoB. The cardiac glycosides are always prescribed with care, as they are known to be toxic at high doses. However, they could offer inexpensive life-saving options for patients with FH. Additionally, a cardiac glycoside in a low dose could conceivably provide an added benefit to patients already taking a statin. Duncan is exploring plans for a clinical trial that would determine the correct dose in hypercholesterolemia patients. Using patient stem cells to screen drugs that are already on the market is a great way to investigate treatments for liver diseases. This article has been republished from materials provided by the Medical University of South Carolina. Note: material may have been edited for length and content. For further information, please contact the cited source.